Formula 1 Singapore Grand Prix 2016 is about to kick off. One of the most exciting races in the F1 calendar will take place on Sunday. Check the betting tips and odds to make the best of this unforgettable example. Not only Formula 1 fans but also the whole sports world is waiting for the Singapore Grand Prix 2016 as it is one of the most exciting car races in the world. Singapore Grand Prix 2016 bears differences from the other races in the calendar due to two special features. First of all, the race will take place at the Marina Bay Street Circuit which is as exciting and dangerous as the famous Circuit de Monaco. Formula 1 fans will see the fastest race cars rally in the streets of Singapore. The second significant feature of the Singapore Grand Prix 2016 is that it will take place at night just to spice things up a little bit. One of the reasons why we love Formula 1 is that the drivers have the privilege to do things that we are not allowed to do in traffic. There is no speed limit, no obligation of turning on the headlights as Singapore streets will be as bright as a fun fair. Singapore Grand Prix has been in the Formula 1 calendar for the last eight years. 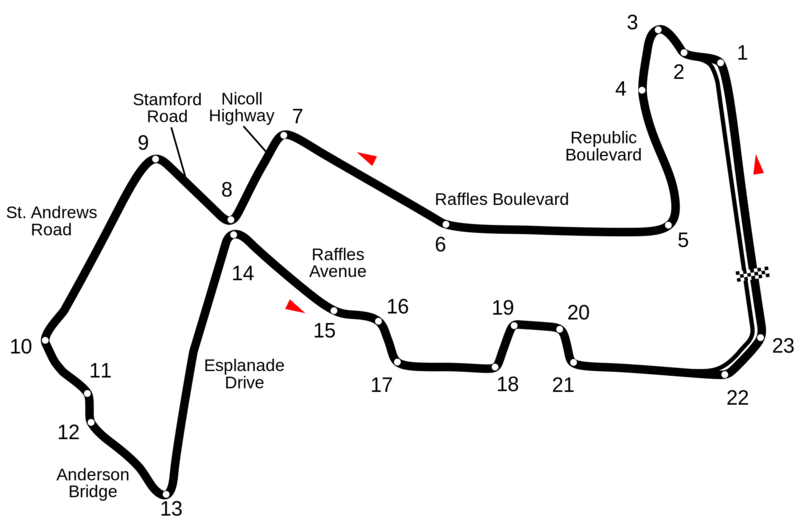 Ferrari and Red Bull won three times each at this circuit. Marina Bay Street Circuit witnessed the last win for Ferrari and Vettel last year. This circuit has the potential to mix things up easily. There has always been a safety car involvement during the previous races in Singapore. Therefore, it is hard to predict the outcome this time. If you are planning to bet on Singapore Grand Prix 2016 online, there are some basic facts that you should not ignore. First of all, Marina Bay Street Circuit resembles Circuit de Monaco in many ways. What does it mean? It doesn’t mean the fastest car will lead the race. Remember the last Monaco Grand Prix. Red Bull’s Daniel Ricciardo lost the first place just because of a mistake caused by his team during a pitstop. Force India’s Sergio Perez managed to get the third place. Yes, the favorite of the race Hamilton ended up winning the race but mainly thanks to luck fairies revolving around his head. Long story short, fastest car do not have the absolute advantage here as there are not many fast straights anyways. Another essential information is that you need to keep in mind that there is a high chance that the cars will need to queue behind the safety car. In other words, Nico Rosberg (probably) won’t be able to push the gas and leave everybody 15 seconds behind. Before the Singapore Grand Prix 2016, there are only two-point difference between Mercedes’ Hamilton and Rosberg. You probably know the fierce rivalry between the two teammates who end up kicking each other out of race quite often. In such a circuit on which constant focus is of vital importance, it wouldn’t be such a huge surprise if Mercs end up colliding at some point, especially if the both drivers manage to get the first 2 positions at the end of the qualifying session. The weather forecast predicts hot race day in Singapore as it will be over 25 and it is expected to be dry. Rain would turn the race into a Sisyphean task, to be honest. As for the Formula 1 2016 Constructors Championship, Mercedes is leading with 498 points. They can announce their title win right after Malaysia as their closest opponent Red Bull has only 290 points. The fight for the second place is fierce since Ferrari is only 11 points away from Red Bull. There is also fight between Williams and Force India for the fourth place. Williams is leading four points ahead of Force India with 111 points before the Singapore Grand Prix 2016. Looking at the recent driver performance and car capacity, we can assume that Ferrari and Red Bull will have more chance than the previous races in Singapore. Ferrari drivers Sebastian Vettel and Kimi Raikkonen are among the most experienced active Formula 1 drivers. They will need their knowledge and the power of practice in this circuit. 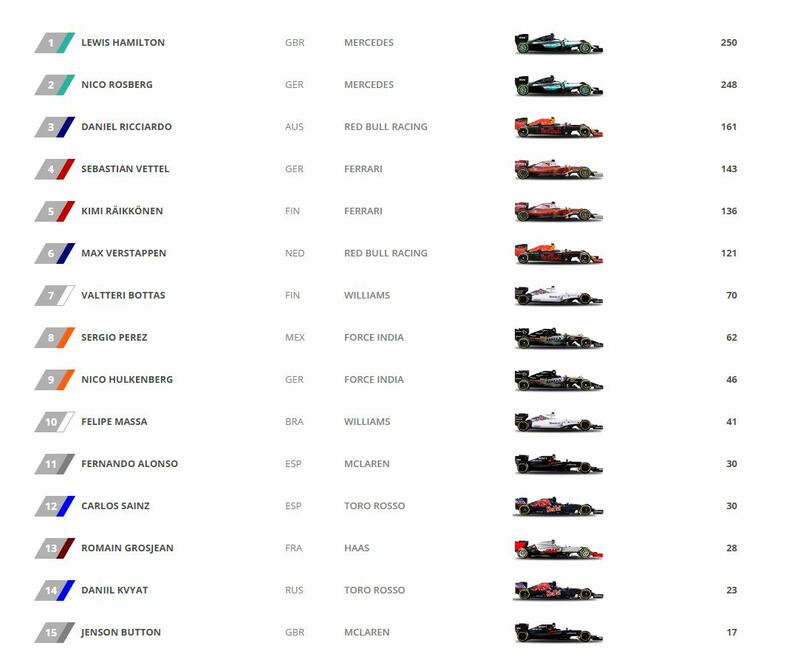 Mercedes drivers are still the favorites; however, we expect a close race between Mercs, Ferraris, and Red Bulls. Our prediction is like this. Now, let’s check what the Singapore Grand Prix 2016 betting odds suggest!